Happy Friday Loves!! I wanted to share with you my summer make up products. When we first moved to Alabama, the foundation that I had been using for about 2 years (Clinique Redness Solution) suddenly stopped giving me the consistency that I had been used to. I'm not sure if it's the humidity here or the heat (!!!) or if it was just time for a change. Last week I went to Sephora in search of a new foundation and they did not disappoint! Seeing that my go-to foundation wasn't working, I had no clue where to start! Luckily Sephora has the coolest scanner that actually scans your face and finds the best foundations for you. The salesgirl was so super sweet and we picked a winner on our first try! 2: Full disclosure- this is my first experience with a primer! I've used eyelid primer before but never for my foundation, I've really never needed it but once I tired it on my hand I had to take it home!! This stuff is the bomb.com!!! It feels so good and makes my foundation go on nice and smooth, it also has an iridescence to it and I could totally see myself wearing it on it's own if I didn't want to wear any foundation but still wanted a little something over my moisturizer. here is the link for the primer! 3: Make Up Forever HD this foundation has great coverage and makes me feel so good in my skin! I've always had a lot of redness especially around my nose, but this foundation covers it up perfectly without feeling cake-y! The color I wear is called 135 = R300 - Vanilla You can use this link to shop my foundation. 4: Hands down my favorite Sephora find of the day!! 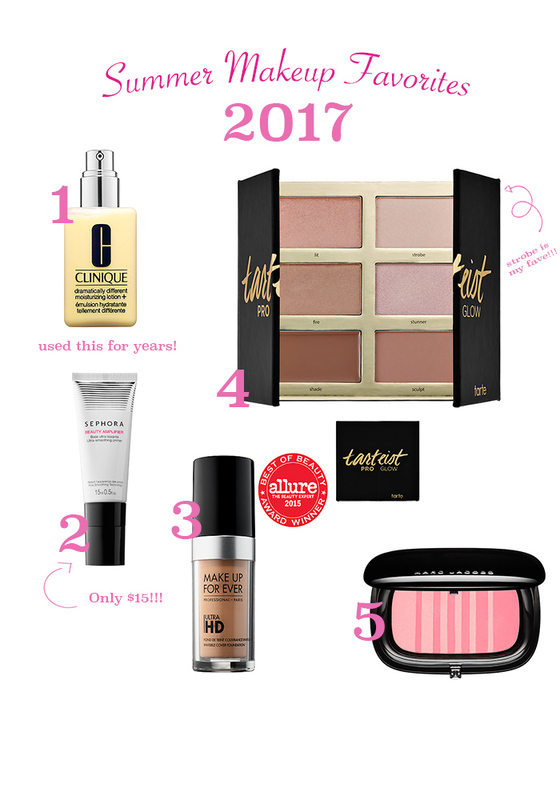 I've used contouring sicks and powders in the past, but this palate is amazing!! The dark contouring color is a cream and goes on so easy and it blends like a dream! When I first tried it, I was expecting to really have to work it around to get it to blend in but it's so so easy! The highlighters are awesome and my favorite is the lightest and sparkliest color Strobe, I've even tried it as a light eyeshadow and it works great! You can find my new favorite palate here. 5: My very favorite blush is from Bare Minerals and it's been discontinued (so sad!!!) but I found this Marc Jacobs one that looks very similar! Even though I have some redness, I like my cheeks pink! There is just something so brightening about having a great pop of blush! Shop the blush here. I hope you enjoyed my very first makeup post :) I had a lot of fun putting this one together!! I hope you have a great weekend!